Resident reggae R&B serenader Christopher Martin brought his smooth sounds to New York City this past week, hitting a number of events and airwaves with his vintage R&B hooks. As the featured performer on the weekly "Rock With Squeeze" series on Monday nights at SOB's, Martin drew a packed house of fans and long time supporters. "The reception from the fans I have there went far beyond my expectations," discloses Martin. "The ladies showed me crazy love, both on the live shows and on the radio shows. New York was a fun-filled and eye-opening trip." And Martin had eyes and mouths wide open as he delivered songs from his budding catalog, with one-drop reggae rhythms like "Driver," "Take My Wings" and "Giving It," introducing New York fans to tunes that have made him a household name back home in Jamaica. And for music connoisseurs in the house, he dove into classic R&B hits, exploiting his lush buttery vocals. It was obvious to the crowd why he is a reigning winner of "Rising Stars," a Jamaican version of the acclaimed talent show, "American Idol." 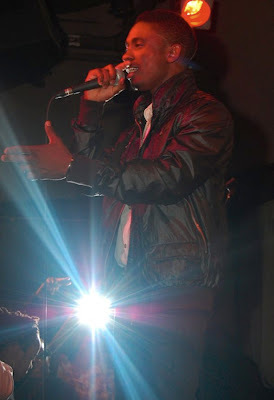 Ever since copping the title, Martin has been making the rounds throughout the reggae entertainment circuit, performing on some of the biggest stages that included Reggae Sumfest and Jazz & Blues Fest in Jamaica to the Jamrock Reggaefest in New York, and has performed alongside the likes of Shaggy to Michael Bolton. Staying on that path, Martin now heads to the highly anticipated BEST OF THE BEST concert in Miami on Memorial Day Weekend (May 24), where he'll share the bill with some of the top names in hip-hop and reggae, including Rick Ross, T-Pain and Serani. Martin capatilized on his time in the top media market by taking his sounds to the airwaves. He appeared on Irie Jam Radio with Jabba, LinkUp Radio with DJ Kevin Crown, BOOM Station in Brooklyn and Mixx96 in Miami with D Life, and on HOT105 in Miami, on South Florida's #1 rated reggae program with Tanto Irie, Lady English and Barrie Hype. "New York was great, the interviews were just like stage shows," reveals Martin, as each DJ requested the singer to prove his pipes by performing live on every show. Get more familiar with this talented artist by tuning into his sounds at www.myspace.com/christophermartinmusic.